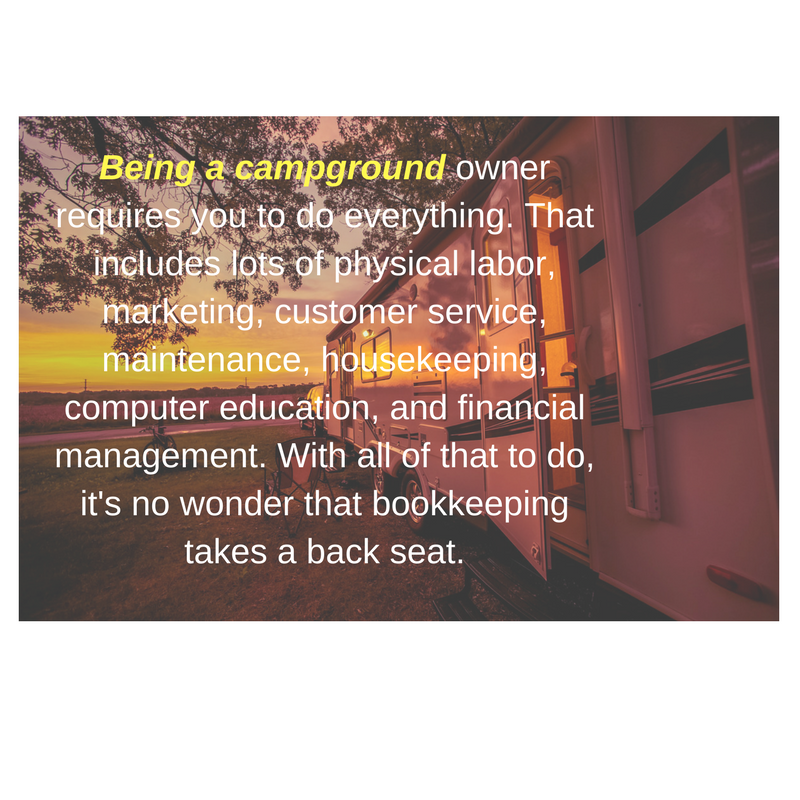 In my time as a campground-exclusive bookkeeper, I have heard a number of complaints from my clients about their bookkeeping woes before they decided to let Happy Camper Bookkeeping help out. Many of them are universal, and these are the five that I hear the most. 1. My bookkeeper or CPA never really listens to me. This complaint is, by far, the one I hear the most. Many of my clients tell me that their former bookkeeper or CPA never really listened to their needs or concerns. They feel like these people should be their partner in helping their business grow and succeed. Often, it ends up that there is minimal communication or advice. The bookkeeper or CPA are simply looking to get the job done and move on to the next client. In my experience, campground owners want a bookkeeper and CPA that will listen to their specific needs. The fix: Hire a bookkeeper that specializes in your industry. Hire someone with experience in both bookkeeping and the campground industry. This person will understand your specific needs much better. They will also listen to your needs and concerns because they want to learn about what people in their niche want. 2. I let my receipts and deposit slips pile up, and I try to get to them by the end of the year. Unfortunately, this is pretty typical with any business owner, but more common with campground owners. Why? The answer is simple. Being a campground owner requires you to do everything. That includes lots of physical labor, marketing, customer service, maintenance, housekeeping, computer education, and financial management. With all of that to do, it's no wonder that bookkeeping takes a back seat. It really is unfortunate because without sound bookkeeping, there is really no way to know how your business is doing. It's important to stay on top of the books because that is the best indicator of what you can do better. The fix: Hire someone to take the books off your plate. You'd be surprised at how affordable it can be, and you'll be amazed at how much time and money it can save you. All of the information about the financial health of your business is in your books. It's SO important to have that information organized. 3. I plan to sell my campground someday, but I'm not really sure what will be required when I do. I hear this all the time. Either people have had the campground for a long time, and they are ready to retire, or people purchase a campground with a turnaround plan. What's required to sell your campground for a healthy profit? You have to be able to show that your campground is profitable, and by how much. How do you do that? You need to have excellent books. The fix: Hire a professional to keep your books. It is important that your books are in order when it comes time to sell your business. Don't start too late. Most banks will need to see at least three years worth of books to grant financing to a buyer. Hiring a bookkeeper can also help you maximize revenue and minimize expenses. Cutting just $5,000 in expenses can lead to an additional $40,000 or $50,000 in value to your campground. 4. I would really love to take a salary from my business. Or, I'm not sure where all my money is going. There are different levels of campground owners. Some are in it for the money. Some are in it because they enjoy interacting with people. Others are in it because they love the outdoors and they don't want to sit behind a desk all day. Whatever your reason for owning a campground is, there is one common factor. They are all businesses. The goal of a business is to make money. That's not to say you can't enjoy what you do, but in the end campgrounds that are not profitable don't last very long. Many campground owners didn't get into the industry to keep great books. Most are people who enjoy the outdoors and enjoy working with people. Many of them just aren't wired to keep great books. However, this is an essential part of running any business and making it profitable. You have to know where your money is going and where it's coming from. If you don't know those two things on a basic level, it will be nearly impossible to increase your revenue and minimize your expenses. The fix: You guessed it! Hire someone that will keep great books for you! Are you noticing a theme yet? There is so much that a bookkeeper can offer your business. I'm not claiming that a bookkeeper will make your business profitable for you. Only you can do that. But, a bookkeeper (at least a good bookkeeper) will help you understand where you can trim back and where you need to increase your revenue. Once you understand where your money is going and where it's coming from, it makes it much easier to make adjustments. Knowledge is power. Knowing your business is the first step in making it profitable! 5. I tried a local bookkeeping service, but the turn over is hard to deal with. Turnover with any employee is hard. It takes time and money to train new people, and you're never really sure what you're going to get! But, with something as important as your books, you want to make sure you have someone long term. Trying to retrain someone every six months is frustrating, and it's hard to have a partner in your business if that person is constantly moving on. Think about this too: Do you really want someone handling your books that doesn't know what 50 amp service is? Do you really want to expose your most personal financial information to someone that doesn't understand why your park models are categorized as RV's? The fix: Hire a bookkeeper that specializes in campgrounds. This firm will have a much more stable presence in your financial life. At Happy Camper Bookkeeping, we strive to be sure we are a partner in your business, not just a firm that enters numbers and calls you once a year. We also understand the camping industry and the unique challenges that you face. I know that this article has a theme, and it may seem like the only goal is to get you to sign up with Happy Camper Bookkeeping. That's honestly not the goal. If you feel like we could be of service to you, then we would love to work with you. You can check out our website or contact us for more information. But, if all this does is encourage you to keep better track of your books and use that data to help your business grow, then the goal has been met. It is SO important to have sound financial practices in any business. You have a range of options when it comes to that. You can choose to work with us, someone else, or get your books in order yourself. Whichever you choose is fine with us. We just want to see you succeed!